Reports coming out of China indicate that another citizen has been caught up in the country's VPN dragnet. 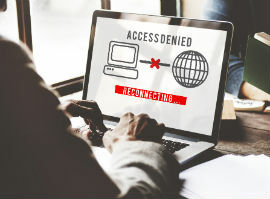 The software developer reportedly set up a VPN for his own use but sensing demand, sold access to the service to third parties. Despite making just $164 from his business, he was arrested and detained for three days. Early 2017, China’s Ministry of Industry and Information Technology said that due to Internet technologies and services expanding in a “disorderly” fashion, regulation would be needed to restore order. Months later, it became evident that authorities were taking an even more aggressive stance towards Virtual Private Networks, since these allow citizens to evade the so-called Great Firewall of China. The government said that in future, operating such a service without a corresponding telecommunications license would constitute an offense. Now, according to local news reports, a citizen who apparently failed to heed the government’s warnings has fallen foul of the new rules. The Nanjinger reports that a software developer, named as Mr. Zhao from Nanjing, was arrested August 21 for contravening the new laws on VPN licensing. Zhao reportedly told authorities he’d initially set up the VPN for his own use in order to access content hosted abroad, which presumably involved circumventing China’s firewall. However, once he recognized there was a demand, the developer decided to let others use the service for a small fee. The prices he asked were indeed small – just $1.50 per month or around $18 for two years’ service. Based on reported total revenues of just $164 for the entire business, it’s possible he had around 100 customers, or indeed far fewer. What will happen to the man isn’t clear but he’ll be keen to avoid the fate of Deng Jiewei, who previously ran a small website through which he’d sold around $2,100 worth of VPN software. These cases are part of an emerging pattern in China centered around the supply and sale of VPN products and services. Back in July, Apple began banning VPN applications from its iOS store in China. The company reported that the apps contained content that is illegal locally, thereby violating the company’s policies.